A nostalgic look at the farms of America shows us the iconic wooden red barn. However, times are changing, and new material needs to be used, and if you want the best steel siding for barn available, then you need to buy your next barn right here at Coast to Coast. Good steel siding for barn is just as important as making sure that your car’s oil is changed often and that you keep up on its repairs. Without good steel siding, your barn is always going to be vulnerable to the harsh weather wherever you live, no matter what kind of staining, varnish, or any kind of maintenance you give it. 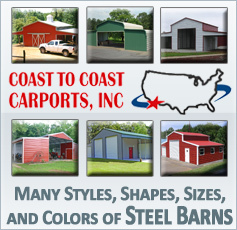 Coast to Coast uses the same steel siding for barn that we use for all of our buildings, and that means that every barn made at Coast to Coast comes with a 10 year warranty on rust through of framing on roofing material assuming normal user care and maintenance. You can look, but you will never find a warranty like that anywhere else. Your barn needs to protect everything in it, and we at Coast to Coast can make that happen with the finest gauge steel for your barn’s siding available. But we are so much more than barns here at Coast to Coast. If you have a need for a steel building, we can fulfill it. 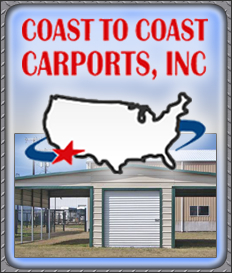 Whether it is a carport, garage, storage building, or even a 100 ft clear span building to house a truck, we can set you up. Your needs are unique, and you will only fulfill them at with a company that understands that you are different than anyone else. Do not waste time going with a company that cannot give you what you want when it comes to steel barn siding. Contact us today for your free quote and to learn about your next big investment.